In the article published in this issue (pp. 547–560), “Biological Control for Grapevine Crown Gall using Nonpathogenic Rhizobium vitis Strain ARK-1”, the corresponding author, Akira Kawaguchi, describes some of the key findings from his recent research which is a biological control using a new antagonistic microorganism to manage the soil-borne grapevine disease “crown gall”. Grapevine crown gall, which is caused mainly by plant tumor-inducing bacteria, is one of the most harmful diseases affecting grapevines around the world, there has been no effective method for controlling it. His research achievements include discovery of a new antagonistic bacterium named strain ARK-1, evaluation of ARK-1’s positive effect to control crown gall on not only grapevine but also other plant species in fields, population dynamics of ARK-1 in grapevine, some mechanisms of ARK-1’s effect, and so on. 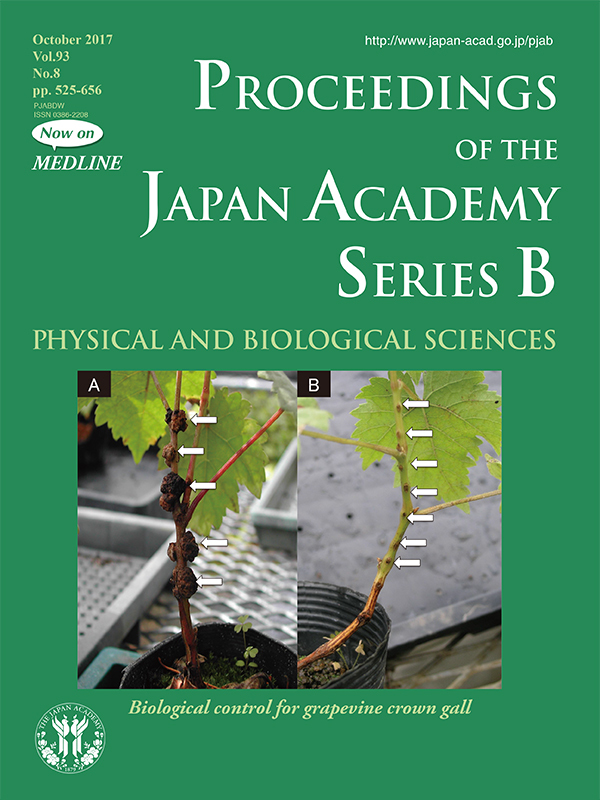 In this cover figure, a stem of grapevine inoculated with only pathogenic R. vitis strain formed tumors on each inoculation wound site (A), but a stem of grapevine inoculated with mixtures of pathogen and strain ARK-1 at a 1 : 1 cell ratio did not form tumors (B). Strain ARK-1 proved effective in reducing the incidence of tumor formation. He also found that ARK-1’s biological control activity is likely based on the suppression of essential virulence genes of pathogenic R. vitis, and the mechanism to reduce the incidence of tumor formation is unique in that it appears to be previously unreported. To develop the new bactericide made from ARK-1, He plans to carry out field validation of ARK-1 under several conditions on crown gall infested vineyards in countries around the world. I believe that his research projects will contribute to controlling crown gall in not only grapevines but also diverse crop species throughout the world going forward.